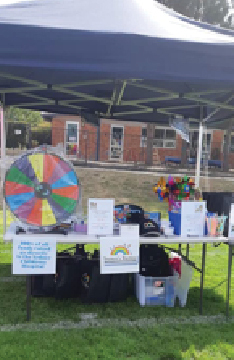 On a perfect Autumn afternoon, Dainere’s Rainbow were so very fortunate to have a Stall at the annual Burgmann School Fair. There was a completely new set up and it was so inclusive and welcoming and it also meant that we were able to reach out and speak to so many more people this year. There was significant interest in the work that Dainere’s Rainbow do and how people can elevate awareness. 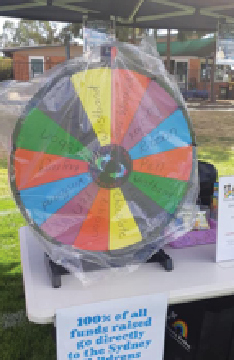 The highlight though for many of those who visited the Dainere’s Rainbow Stall was the Rainbow Prize Wheel. Everyone was a winner and many walked away with one of the splendiferous Dainere’s Rainbow Merchandise items, others were fortunate enough to take away a block of chocolate and the very lucky ones spun and won a gift card or voucher. 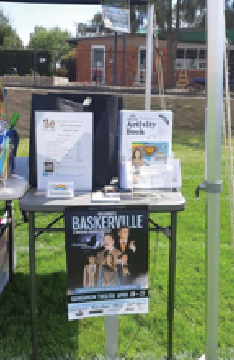 We were also able to advertise the Bal Masque Gala Fundraising Dinner and Dramatic Productions latest gem: Baskerville A Sherlock Holmes Mystery. We are so humbled by the support of the Burgmann and Gungahlin Community and are thrilled to announce that $372.00 was raised as well as awareness beyond all measure. 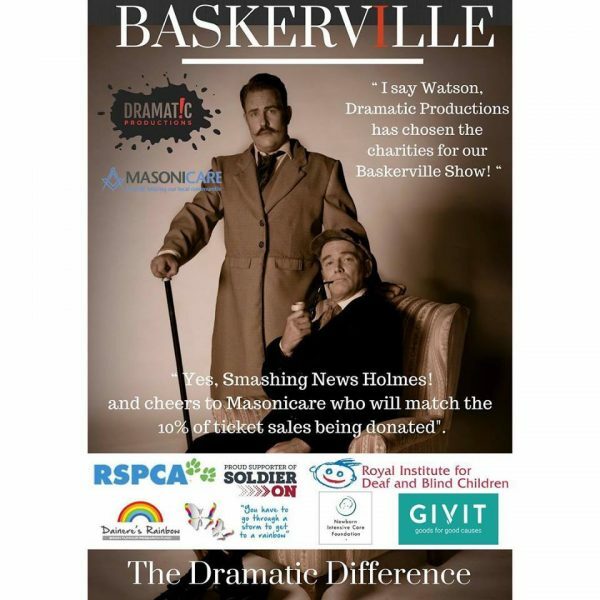 Bookings are now being taken for the Dramatic Productions – Baskerville Show, we encourage you to head over to the Dramatic Productions website and purchase tickets. All tickets purchased for the 20th of April show will help raise funds for Dainere’s Rainbow, we hope you help support us and Dramatic Productions. Ticket prices are $22 for children under 18, $36 concession, $38 Adult and Group of 8+ $34 per person. In this hilarious adaptation of one of Sherlock Holmes’s most classic stories, two actors play the roles of Holmes and Watson, while three other actors play the other 36 characters! Don’t miss the fun, laughs and intrigue as the case twists and turns towards its final climatic conclusion! Dramatic productions is also proud to announce the 6 local Charities for whom Baskerville will make a Dramatic Difference! Looking for something special to do on Friday 15th March – Dainere’s Rainbow are so very humbled and honoured to have a stall at The Burgmann School Fair. During the Year that Dainere should have turned 21 this means so much as she began the concept of having a Stall at the Fair to increase awareness of and raise significant funds for childhood brain tumours. To honour Dainere and her truly selfless, tireless and inspiring legacy, the Stall this year will be extra special and we would love to see many new visitors as well as treasured old friends. The stall will have Dainere’s Rainbow Showbags, Merchandise, Lucky Prize Wheel and awareness material. 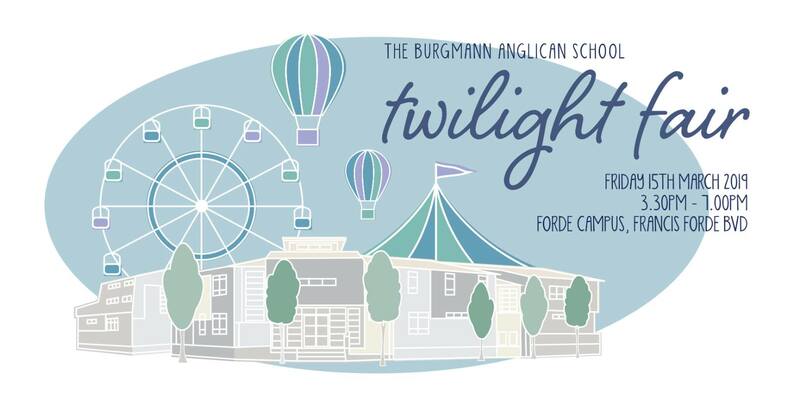 With our deepest and heartfelt gratitude to the Burgmann Fair Committee for allowing us to be part of this event. Friday, 15th February marked International Childhood Cancer Day. 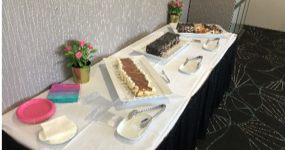 The Dainere’s Rainbow Team, for this day organised our annual Committee and Partners Event, which took the form of a special morning tea, held in Canberra at the picturesque Gungahlin Lakes Golf and Community Club. 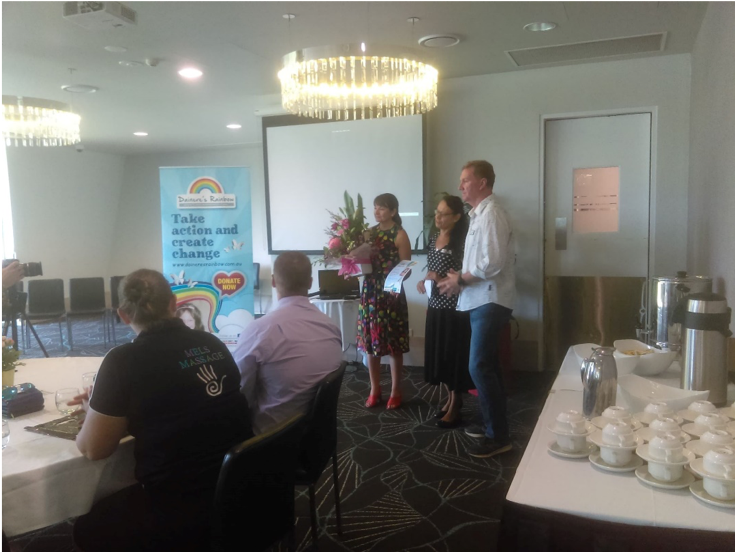 It was an absolute honour for our family and members of the Dainere’s Rainbow Committee to welcome several representatives of our phenomenal long-time supporters: Qcity Transit, Rolfe Property Services, WMG Legal, Transit Graphics, Regional Wholesale Fruit, Mels Massage and My Gungahlin, they are all considered truly valued members of the Dainere’s Rainbow Family. We also have the special privilege to welcome some incredible new, interested businesses and individuals along. Gratitude is also extended to Alistair Coe MLA for taking the time to join us and showing a genuine interest in learning more about paediatric brain tumours. 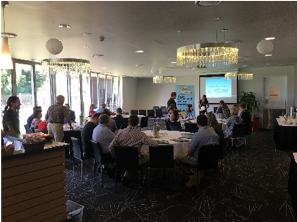 We were so extremely grateful and fortunate to have an extraordinary guest speaker; Elizabeth the CNC Neuro-Oncology from Sydney Children’s Hospital. Elizabeth presented the guests with an extremely moving video with images of children she had worked with. 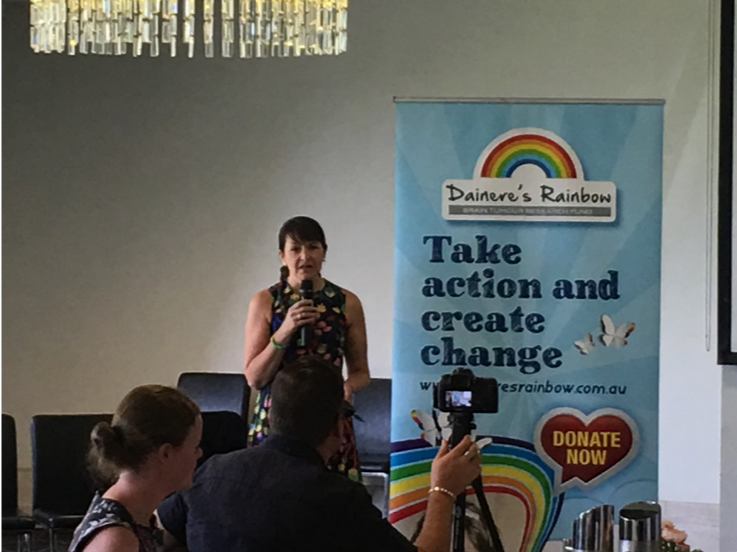 She then passionately and eloquently spoke about the incredible work of Associate Professor Ziegler, explained in depth how clinical trials worked and the significance of community funding through hardworking charity organisations like Dainere’s Rainbow. 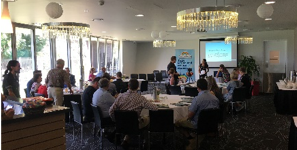 During the presentation the vital importance of awareness raising and how even the most simple and smallest action all contribute to making an enormous difference. So never think you can’t do anything. An opportunity for questions was given and there were some excellent questions, answered professionally and in depth. 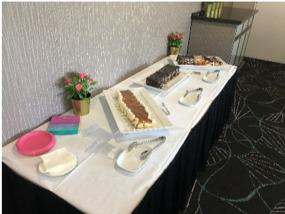 Then those present were treated to a scrumptious morning tea and the opportunity to speak with others who attended the event as well as find out more about Dainere, Dainere’s Rainbow and Partnership Opportunities for the upcoming Bal Masque Gala Fundraising Dinner. It was such an insightful and significant presentation and we again wish to express our heartfelt gratitude to everyone who attended or were involved. If you would like to know more about the work of Dainere’s Rainbow, please do not hesitate to contact us at any time via email to organise a meeting. As part of our commitment and a goal Dainere so tirelessly, selflessly, inspirationally and passionately worked on throughout her short life, we are honouring her wish of elevating vital awareness and desperately required funds for this crucial research to continue. 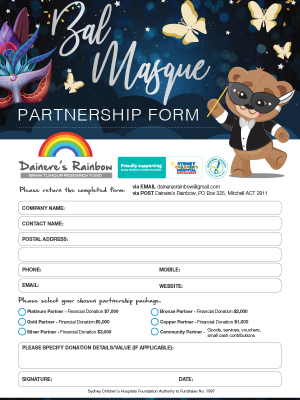 We humbly invite your offer of Partnership, to help us celebrate Dainere’s legacy and give hope to other children at our Premier Fundraising Event, the 2019 ‘Bal Masque’ Gala Dinner, on Saturday 15th June 2019 at The Abbey Function Centre, Gold Creek Village, Nicholls ACT. 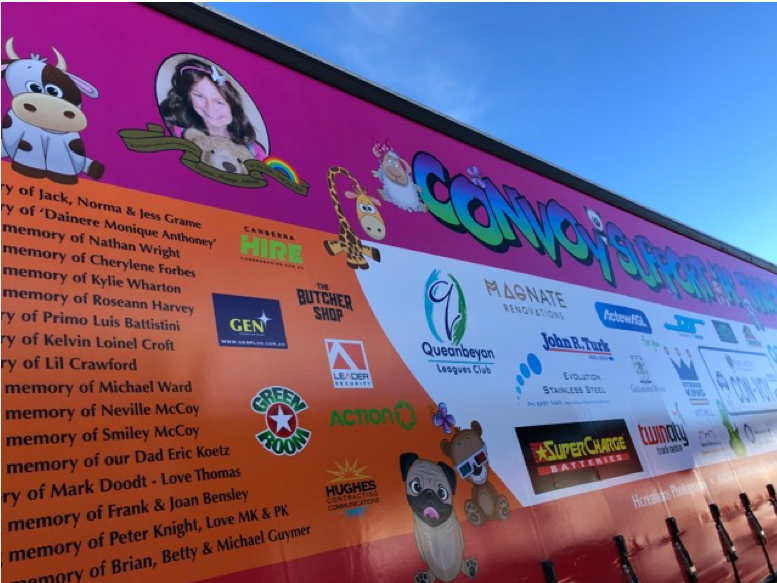 As at November 2018, Dainere’s Rainbow with the wonderful support of our Partners and the Community have raised a phenomenal $351,715.00 of which 100% has gone towards research projects and support for paediatric brain tumours. Community Partnerships are donations of goods, services, vouchers, small financial contributions or other. An overview of each of these Partnerships for your consideration can be found on our website here, or in the below 2019 Prospectus. Alternatively, we can tailor a Partnership specifically for you. If you were wanting to become a partner you can enquire online here, or download the form below and mail it to us. Your Partnership will significantly support Dainere’s Rainbow’s efforts to dramatically increase awareness and raise substantial funds for research to work towards a cure for paediatric brain tumours. We believe that when united we can take action, give hope and create change for every single child diagnosed with a brain tumour; every child deserves the chance of a long, healthy and happy future. Please do not hesitate to contact us for further information, we would be absolutely delighted to organise to meet with you to discuss the 2019 ‘Bal Masque’ Gala Dinner or The Dainere’s Rainbow Fund. In the year that Dainere should be celebrating a significant milestone Birthday – her 21st our Gala Fundraising Dinner is themed for Dainere. 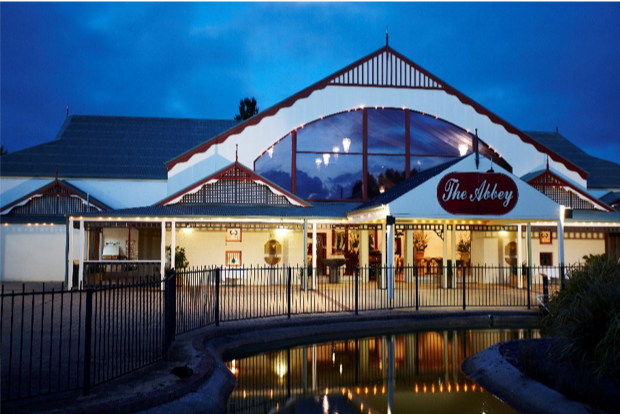 It is a Bal Masque (Masquerade Ball) and will be held on Saturday 15th June 2019 at the exquisite Abbey Function Centre in Nicholls. The evening will take the form of the sit down elegant three-course meal with special entertainment, raffle, live and silent auction and more. We invite you all to mark this evening of elegance, mystique and intrigue on your calendars and to watch the Dainere’s Rainbow Social Media and Website for further details and how to make table bookings. Would you like to be part of an extraordinary team of people uniting to give hope and create change for every single child diagnosed with a paediatric brain tumour in Australia? We are currently preparing the Partnership Prospectus, there will be the opportunity for Major Partnerships, Community Partnerships or a tailored Partnership. If you are an individual or business or know of anyone who would like to be involved in supporting this premier Canberra Event please contact the Dainere’s Rainbow Team via email daineresrainbow@gmail.com and we can organise to have an electronic version of the Partnership Prospectus as soon as they are available emailed through to you or we can organise to deliver a hard copy for you or we can arrange a meeting to discuss the opportunities available. Are you or do you know of any unique entertainers in Canberra or surrounding areas? We have the most extraordinary band, MC and special guest for Dainere’s Rainbow Bal Masque Gala Fundraising Dinner 2019 but we are looking for something a little bit unique and different to dazzle, mystify or intrigue our guests especially for Dainere’s 21st Year Dinner. 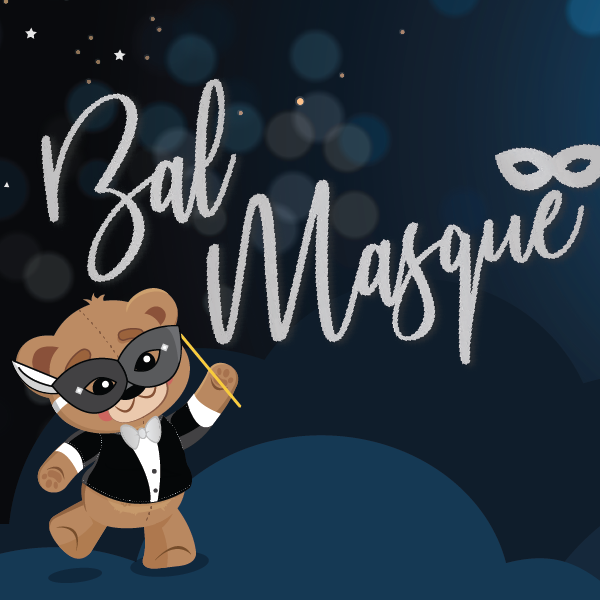 Perhaps you are a fortune teller, palm reader, magician, mime, ballroom dance couple, dancer, acrobat, juggler or unique performer who may be interested in being a special part of Bal Masque. Perhaps you know of someone and are able to pass on their details. We would absolutely love to hear from you. Please contact the Dainere’s Rainbow Team via email daineresrainbow@gmail.com and we will get in touch to discuss the event further with you. More information about this event will be shared soon! 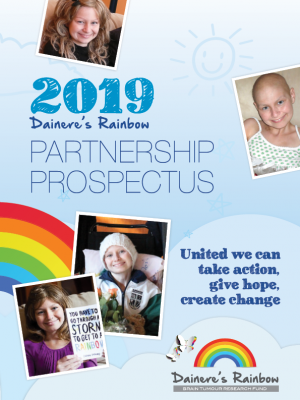 There are so many big plans for Dainere’s Rainbow in 2019 to see a brighter light of hope and positive changes for the precious children diagnosed with paediatric brain tumours, those who are currently fighting and those that have survived but face each day with such devastating side effects from treatment. All in honour of Dainere and the other most beloved children that have had their lives stolen by this number one disease killer of children in Australia. An entire classroom of children should not be losing their lives to this disease each year. 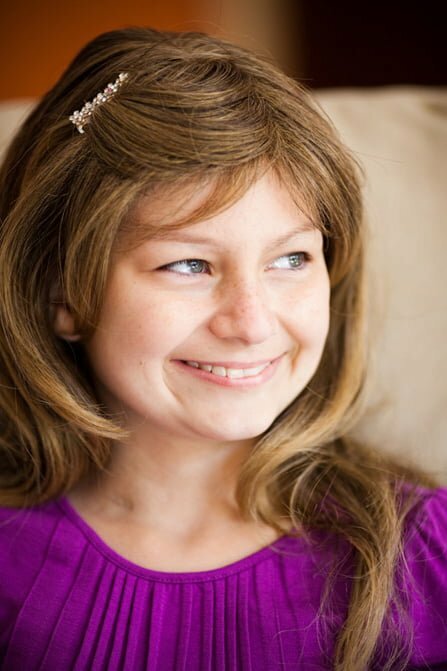 2019 is the year that Dainere should have been celebrating a significant milestone; her 21st Birthday and it will also be ten years since her truly life changing diagnosis. There are other special family events that she should be there for in 2019 but tragically cannot be. Again, we reach out to you all with our most heartfelt, sincere and humble gratitude and would be extremely honoured to have your incredible support again in 2019, it is a united team effort that can create massive and positive change. If you would like to assist us to continue Dainere’s most selfless and inspirational work, please follow the Dainere’s Rainbow Facebook Page, Instagram, regularly read the website, join the mailing list or attend any Dainere’s Rainbow events or awareness raising activities. We would like to share words from Dainere to begin 2019. “It is so hard to believe that another year has passed by, we have a Calendar at home and it has a little inspirational poem for New Year on it, it does not say who wrote it, I would like to share it with you all, as I feel it sums up how we can live our lives throughout the coming year. 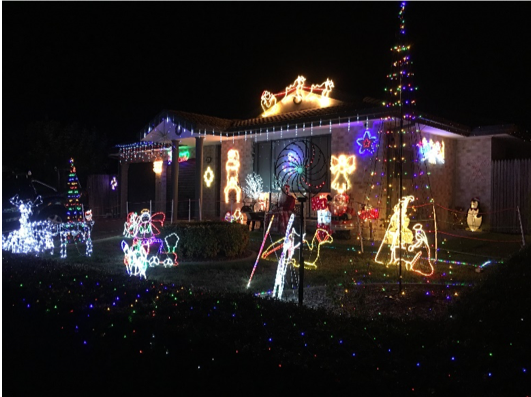 From 1st to 25th December the Dainere’s Rainbow Christmas Wonderland Lights Display took place. 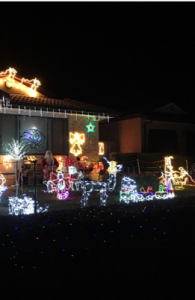 The display was originally the mastermind of beautiful Dainere, who was inspired to bring joy, hope, smiles and Christmas Spirit to the Community as well as elevating vital awareness and raising desperately needed funds for paediatric brain tumour research. She did all this whilst in pain and used her own pocket money to purchase many of the original lights in the display. Some of those lights are still part of the display today. 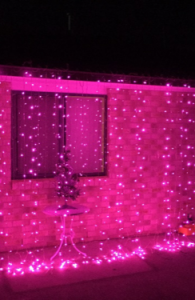 Dainere left the family with many ideas for expanding the lights display to continue to give a knowledge of paediatric brain tumours throughout the Community and of course raise funds. She also asked that the lights continue to be meaningful and to give to the Community a gift of warmth and enjoyment from the lights. This year the display took on a brand-new look and format which received extremely positive feedback from many of our wonderful return families as well as people who had never visited before but left with enormous smiles and a twinkle in their eyes vowing to put the display as a must visit for 2019. We were extremely fortunate to have all the way from the North Pole Mrs Claus visit the lights on 22nd and 24th December this year and she has promised to return in 2019. We also had the truly talented Molly Coddle Parties applying the most sparkling Christmas Glitter Tattoos on 22nd December as part of the Anthony Bear Event that evening. 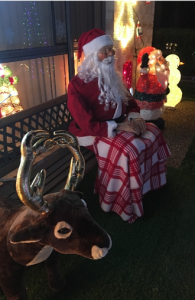 Santa himself also popped along on several evenings and was very popular with many selfies taken with him. There were big winners on the lucky numbers, beautiful craft items many made by the marvellous and talented Alba purchased as gifts, excitement at the lucky dip prizes and the scrumptious gingerbread made by the incredible Liz, Chris and Jenny we were told several times that it was the best gingerbread ever! A question that is often asked by visitors is – How long does the display take to plan and put up? The planning goes on throughout the year, we are already following Dainere’s guidance and are working on a special new addition to the lights in 2019. It takes months of preparation including checking and repairing lights and then putting them up over a two-week period. It also involves maintaining the lawn and gardens and advertising. The other question we often are asked is where we get our lights from? We do get some from local businesses, but many of the unique ones we find online. The lights are funded by our family, as are the small giveaways each night, they are our gift to everyone. The items on the stalls we have had are donated by the most wonderful people with the light of human kindness and Christmas Spirit, we are so grateful to those people. 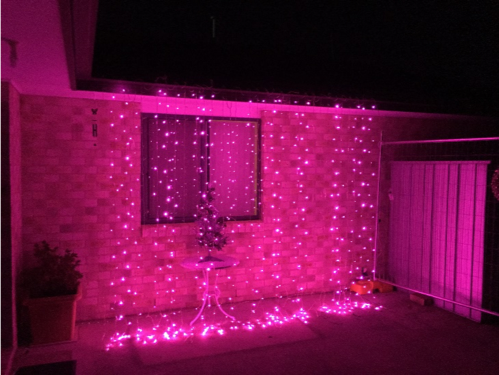 One thing to remember is that 100% of all funds raised at the Dainere’s Rainbow Christmas Lights Displays go directly to crucial research programs and projects that are in honour of Dainere and as directed by our family by the extraordinary Associate Professor Ziegler and his team of amazing researchers at Sydney Children’s Hospital, Kids Cancer Centre. 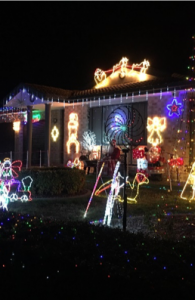 We wish to thank every person who supports the Dainere’s Rainbow Christmas Wonderland Lights Display and we would like to announce that a grand total of $2857.60 this December. 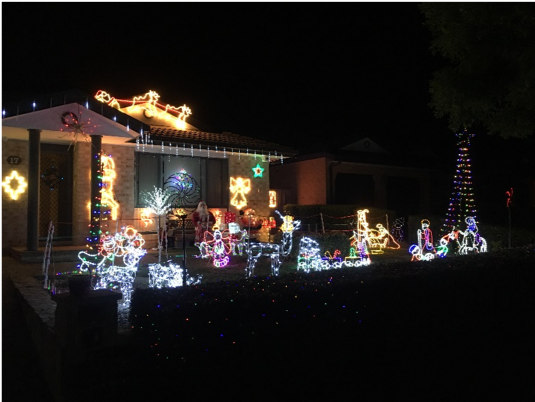 On Saturday 22nd December in conjunction with the Dainere’s Rainbow Christmas Wonderland Lights Display, there was a special gathering of the 2018 Myer Christmas Bear ‘Anthony’ and his owners. A downpour of rain just prior to the event was followed by the most magnificent and rather poignant rainbow that arched across the early evening sky and then a cool but chilly night. 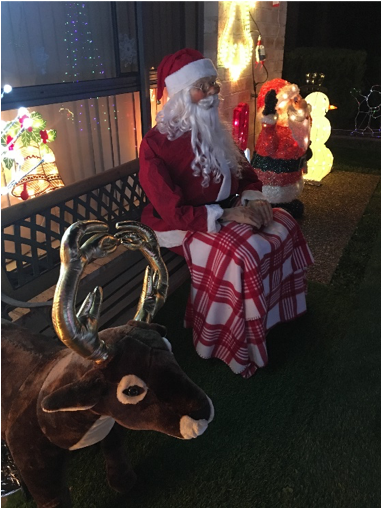 Many from the Canberra Community joined this splendiferous event holding their treasured ‘Anthony Bear’, knowing that they were creating a beacon of light and hope this Christmas for children diagnosed with paediatric brain tumours. The meaning and significance of Anthony was shared as well as the true spirit of Christmas with smiles, new friendships, a greater knowledge and awareness, the gift of giving and fabulous fun had. The evening had the incredible Molly Coddle Parties applying the most fabulous glittering Christmas Tattoos to a line of excited children, the extraordinary Mrs Claus greeting guests with such warmth and taking orders to pass back to Santa, a stall of beautiful gifts, some big winners on the lucky numbers, Christmas Craft Activities for the children and adults, dazzling glow sticks, a candy cane or two and the brightly shining Christmas Lights to delight all. 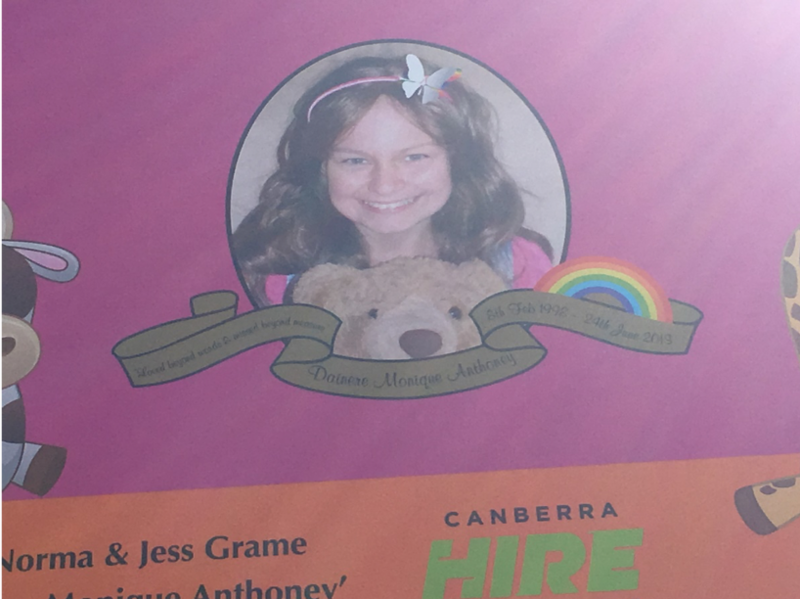 In a historic; first time ever tribute to an individual, Myer named their 2018 Christmas Bear as a tribute and honour to the inspiring Canberra Local, Dainere Anthoney, after hearing her heart-warming story of strength, optimism and her continued and selfless drive to support other children battling paediatric brain cancer which tragically took her young life in 2013. 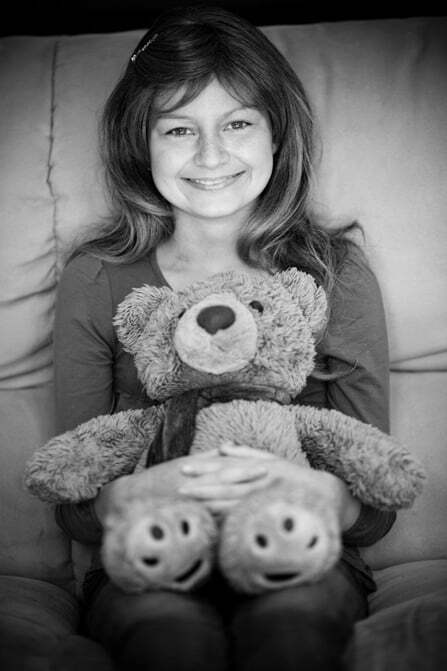 Dainere was also an avid Myer Christmas Bear collector; having received one from Santa Claus every year from birth; her favourite was Theodore who supported her throughout her illness and rests with her today. Dainere’s story and her love of the Myer Christmas Bears re-enforced that for many; both young and old that the Myer Christmas Bear is far more than just a bear. Dainere’s family; Stephen, Yvonne, Nalani and Jarrett and their small team of volunteers with enormous hearts, passion and enthusiasm who form the Dainere’s Rainbow Committee continue Dainere’s legacy and her tireless paediatric brain tumour advocacy and work of elevating awareness and raising funds supporting the work of Associate Professor David Ziegler at Sydney Children’s Hospital, Randwick in developing and testing new and innovative treatments for children with brain tumours. Paediatric Brain Cancer kills more children than any other disease in Australia; taking the lives of a classroom of children each year. 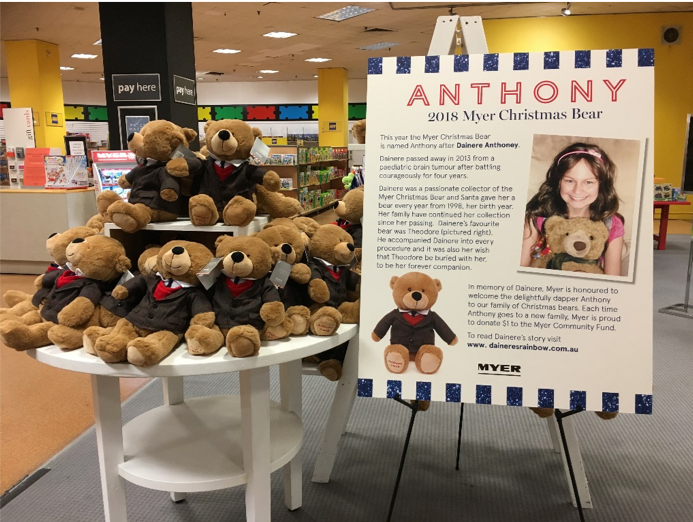 The Anthony Bear is still available to purchase from all Myer stores nationally and online.